Full Team Squads CPL T20 2017- Know, in which team are world’s greatest players ?. 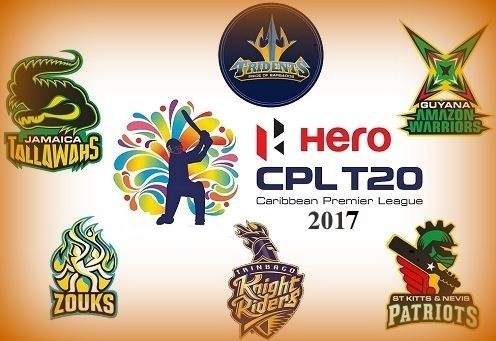 The beginning of the fifth season of the Caribbean Premier League, starting on the lines of the Indian Premier League, is going to start from August 4 (Friday late night). Once again many of the world’s legendary cricketers are ready to play against each other against each other. A total of six teams are participating in the tournament – Jamaica Tullah, Guyana Amazon Warriors, Barbados Tridors, St. Lucia Stars, Trinbago Knight Riders and St. Kitts and Nevis Patriots. The first match of the tournament will be played between St. Lucia stars and Trinbago Knight Riders, while Guyana Amazon Warriors will face St. Kitts and Nevis Patriots on that day. The final of the tournament will be played on 10th Century at Brian Lara Stadium in Trinidad. Defending champions Jamaica international players such as Tllawah team Kumar Sangakkara and Shakib Al Hasan while watching Kesrik Williams and will be on Rovman Powell. Last season’s runner-up team Guyana Amazon Warriors of command is in the hands of Martin Guptill of New Zealand. Afghanistan’s leg-spinner Rashid Khan can prove to be the biggest player of the team. In the last season, the team’s performance was not something special and the team was at fifth position. Captain Kieron Pollard dangerous batsman own T20 but they are also present redoubtable batsman cricket with Kane Williamson. Team – Kiran Pollard (captain), Ken Williamson, Shoaib Malik, Dwayne Smith, Nicholas Puran, Wayne Parnell, Ravi Rampal, Wahab Riaz, Ramon Reifer, Christopher Barnwell, Imran Khan, Damon Yakub, Akil Hossein, Ryan Viggins, Tino Best. Shane Watson, Lasith Malinga, had to be content with the fourth place in the last season. The team’s command is in Darren Sammy’s hands. In the last season the team missed the final. But this time the effort will be to become a winner. There are players like Brandon McCullum and Dwayne Bravo in the team, and a spinner like Mehdi Hassan is also there. The team’s command is in the hands of Bravo. The team, captained by Chris Gayle, had to stay in last place in the last season. There are many great players of T20 in the team and their expectations will be best performing this time.